Our position on this subject is that the science is settled: the influence of carbon dioxide on global climate is negligible; higher levels of carbon dioxide are on the whole beneficial to life on Earth. Our Chief Scientific Officer presenting his work to a young and impressionable audience. The essential question is: What is the warming effect of carbon dioxide on the Earth's atmosphere? Answering this question is the goal of the research to determine the 'climate sensitivity'. The value for the climate sensitivity is the temperature change (in Celsius degrees) that results from a doubling of carbon dioxide in the atmosphere. The reason we speak of a doubling of carbon dioxide and not just a unit increase in parts-per-million is that the absorption of radiation by an absorbing gas is a logarithmic function: as the number of molecules of the gas in the mixture increases there is progressively less radiation left over that can be mopped up by the extra molecules of absorber. Ultimately we get to a saturation point beyond which there is as good as no effect. We can create a very close analogy with a glass of tapwater and a bottle of black ink. If you put a few drops of the black ink into the water it will become slightly darker and a little less light will pass through. As you keep adding ink to the water it will get darker until you will finally come to a point where the water is effectively opaque – just about as black as the ink, in fact. Adding more ink therefore makes no appreciable difference. Returning to our atmosphere now, the value for climate sensitivity (lets call it t°C for the moment) allows us to state that if there is a doubling of the amount of carbon dioxide from the present level of about 400 ppm to 800 ppm then the warming this will cause will be t°C. If carbon dioxide then doubles from 800 ppm to 1600 ppm then the warming this will cause will also be t°C, from 1600 ppm to 3200 ppm also t°C and so on. How big is 't'? According to the latest research it is somewhere between 2°C and 0.5°C, a reasonable guess might be 1.5°C or even a bit lower. 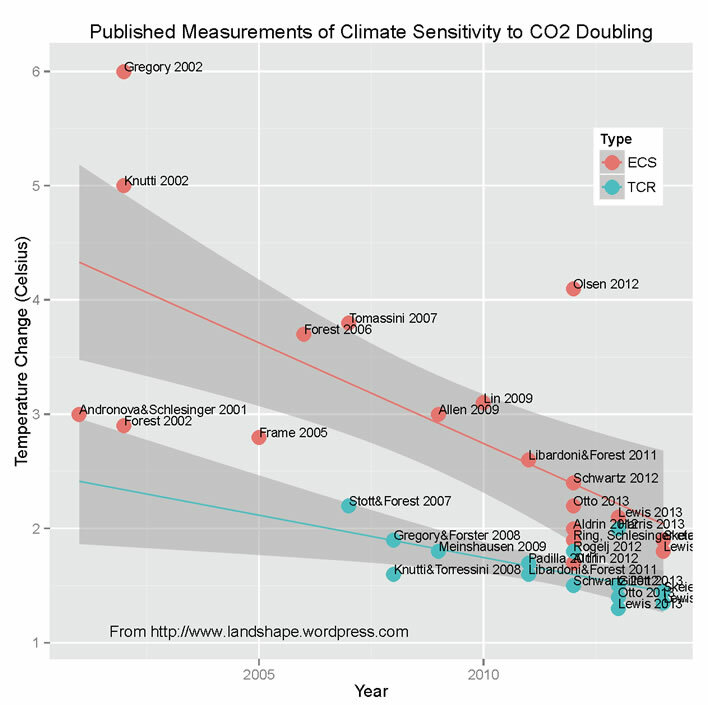 Here are some of the estimates of climate sensitivity that have been published over the years. 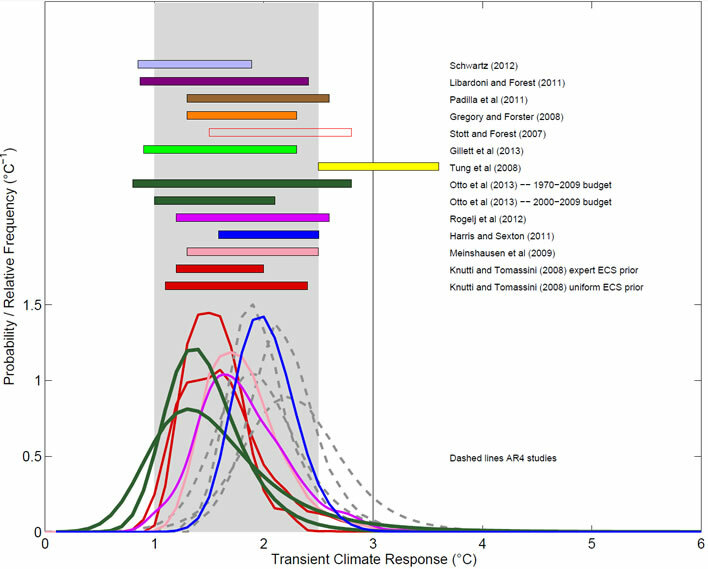 The Transient Climate Response is the climate sensitivity over a period of 20 years. Published measurements of climate sensitivity are declining. ECS (Equilibrium Climate Sensitivity) is the estimate of the very long term changes. 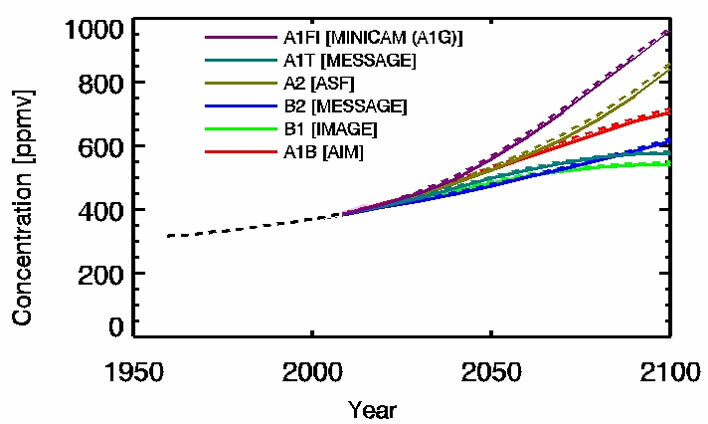 TCR (Transient Climate Response) is the estimate for the next 20 years. Source: Landshape.org. We shall use the reasonable guess of 1.5°C in the rest of the discussion. Why can we speak of settled science? Surely all this might be refuted tomorrow? Well, on planet Popper that is true, but on planet Earth a new value for this collection of estimates that was wildly different from the others would deserve special attention and a lot of checking. If no fault could be found in it there would have to be serious questions asked about the entire basis of radiation physics in the atmosphere. So that, when we say 'settled' in this context we mean 'trustworthy' – not 'true', but 'trustworthy'. If the question of the warming effect of carbon dioxide is important to us, then this is the only estimate we can reasonably to go with. How long will it take for the proportion of carbon dioxide in the Earth's atmosphere to double? 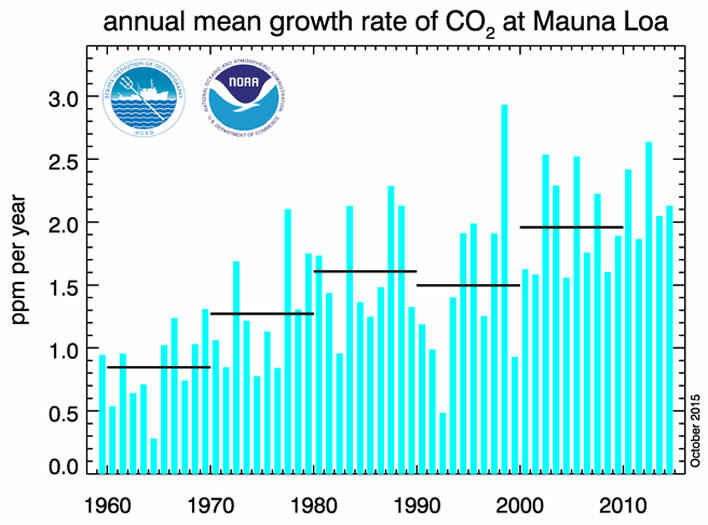 At the moment the rate of increase of carbon dioxide appears to be 2 ppm per year. The current guess for the concentration to go from 400 ppm to 800 ppm is not a back of an envelope calculation but rather a back of a postage stamp calculation: 400/2 = 200 years. This guess should really make assumptions about the permanence of the carbon dioxide that is already in the atmosphere (its half-life decay), the absorption of atmospheric carbon dioxide by 'sinks' such as the oceans and any other feedbacks we may not yet know about. It also assumes that the rate of increase in the output of carbon dioxide from human sources will remain unchanged. Some calculations by people who need to use machines to do their sums are here. 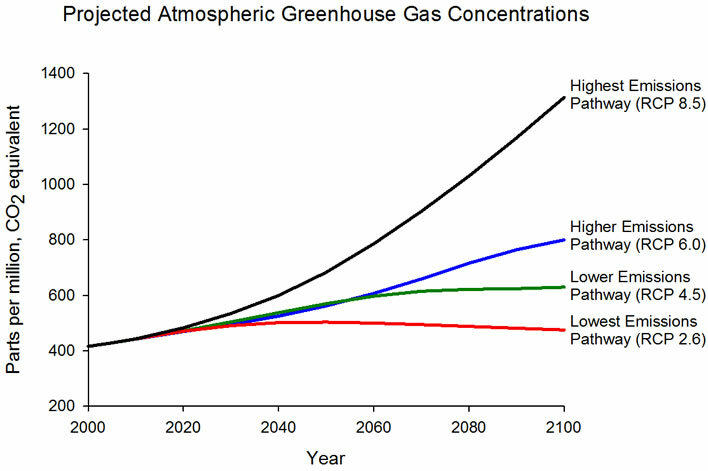 This figure shows projected greenhouse gas concentrations for four different emissions pathways. The top pathway assumes that greenhouse gas emissions will continue to rise throughout the current century. The bottom pathway assumes that emissions reach a peak between 2010 and 2020, declining thereafter. You can take the worst case or the best case according to your taste – they are still just guesses. Let's take, for argument, a baddish case: 100 years. What does the value of 1.5°C warming for a doubling of carbon dioxide over a hundred years mean in practical terms? Diddly squat, to use a technical term. The temperature change caused by a doubling of the present level of carbon dioxide will be barely noticeable in any practical sense. In the context of the great swings in climate caused by variations such as the Pacific Decadal Oscillation, the Atlantic Multi-decadal oscillation, El Niños, La Niñas and changes in solar radiation, coupled with the effects of unpredictable events such as volcanic eruptions and highly erratic weather patterns, that size of change of temperature will be difficult to detect. In addition to that we have those damned butterflies in the rain forest flapping their wings, thus a naturally chaotic component. If, therefore, we assume with some assurance that the figure of 1.5°C for climate sensitivity that the 'settled science' gives us is correct, what are the consequences? All measures to control the emission of carbon dioxide will have no appreciable effect on climate and as such are completely pointless and worthless. All wind farms, on or offshore, wherever they may be are a useless waste of money; ditto all subsidies to erect, maintain and operate them. Damage to countryside, seabed, birds, bats and nuisance to humans. All solar schemes, whether flat panels of focused ovens, ditto. All tidal and wave power schemes, ditto. Enormous environmental damage to the seabed and the marine environment generally. All burning of biomass. Grave reduction of arboreal environments. Decommissioning viable energy sources such as coal-fired power stations in pursuit of lower emissions of carbon dioxide is also a pointless risk to energy security and the diversity of supply sources. 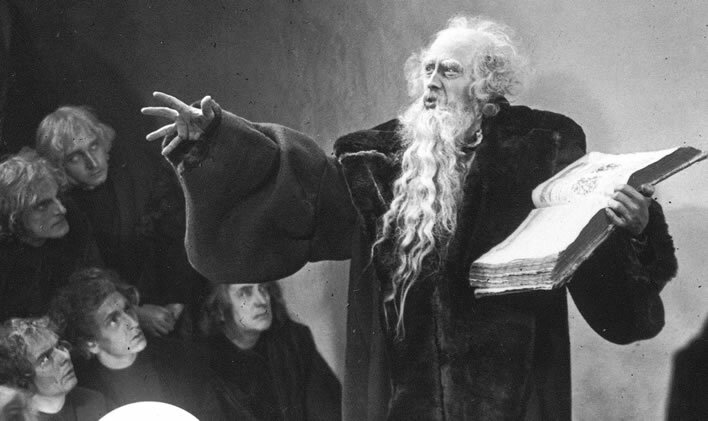 All the anciliary virtue signalling, such as unplugging phone chargers, using forms of low-energy lighting etc. are usually completely misconceived. Additionally, for all of these measures we have to consider the 'opportunity cost' of using money for pointless projects when there are many much more beneficial projects it could have been spent on. The sums here are unimaginably great: worldwide in the hundreds of billions of dollars. As a radical thought: such money might even be left in the pockets and purses of the beleaguered taxpayers and consumers. And what of all the other 'science'? The temperature plots both modern and proxy, the receding/extending glaciers, the receding/extending icecaps, the increasing/decreasing frequency of extreme weather events, the ([hottest/coldest/wettest/driest] [year/month/summer/winter] since [whenever]) competitions and so on and so forth. It is irrelevant to our initial question. If carbon dioxide is having a negligible effect on atmospheric temperatures on Earth, such work is interesting at best, but certainly does not make any statement about the connection of carbon dioxide with global warming. It certainly does not justify any of the measures to reduce emissions. Even if a temperature plot correlated quite highly with carbon dioxide content in the atmosphere – which it never does – this would still only be correlation and not causation. Michael Mann's now much derided hockey stick plot of global temperature tried to smooth out real-world variability to make such a correlation. But even if the hockey stick were correct – which it isn't – it would be still no more than a correlation. The only thing that counts is the climate sensitivity a.k.a. the real, settled science.